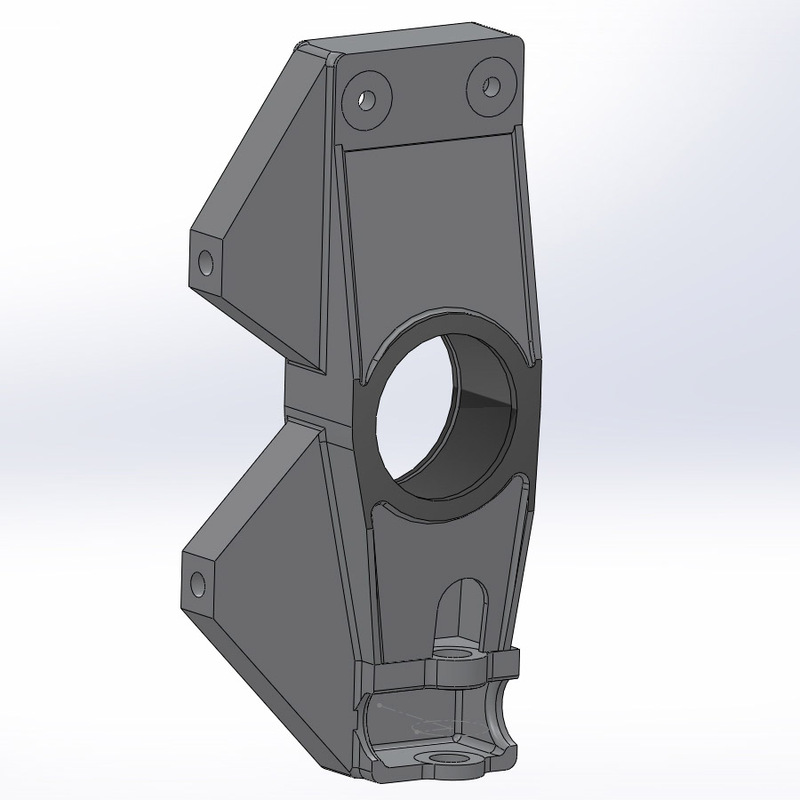 The suspension uprights have gone through a long evolution, but I’m zeroing in on the goal. 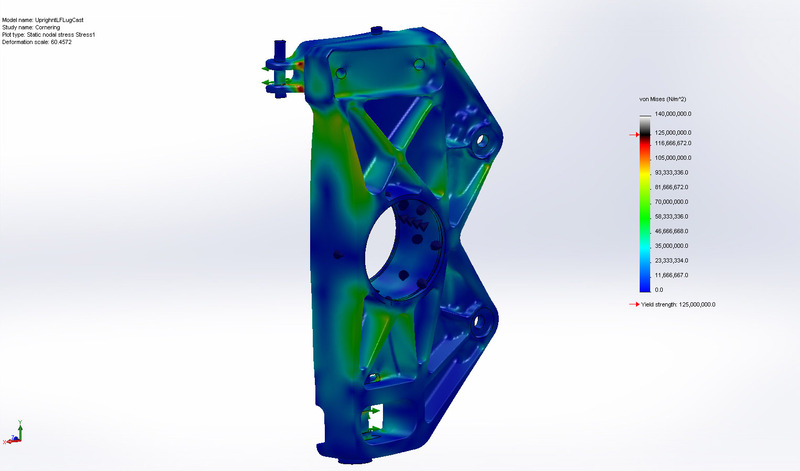 This design uses radial-style brake caliper mounting. Needed to be redesigned when someone ordered the lug-mount calipers and had them delivered all the way from the USA. Probably a Freudian slip as they’re less expensive. Second design was fabricated from steel. Unfortunately, welding will eliminate the temper in the heat-affected zones. The weakening due to this is hard to predict, and can only be eliminated by heat treatment. That would mean days or weeks finding and learning to deal with a heat-treatment supplier. 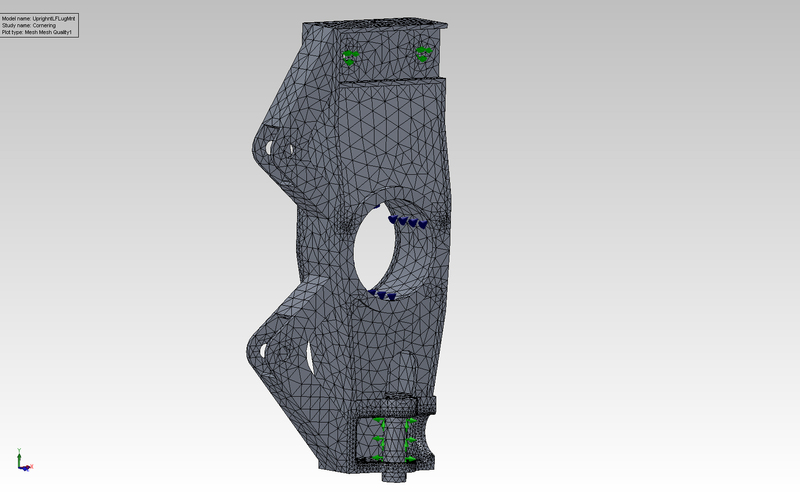 Mesh used for finite-element analysis of fabricated steel upright. 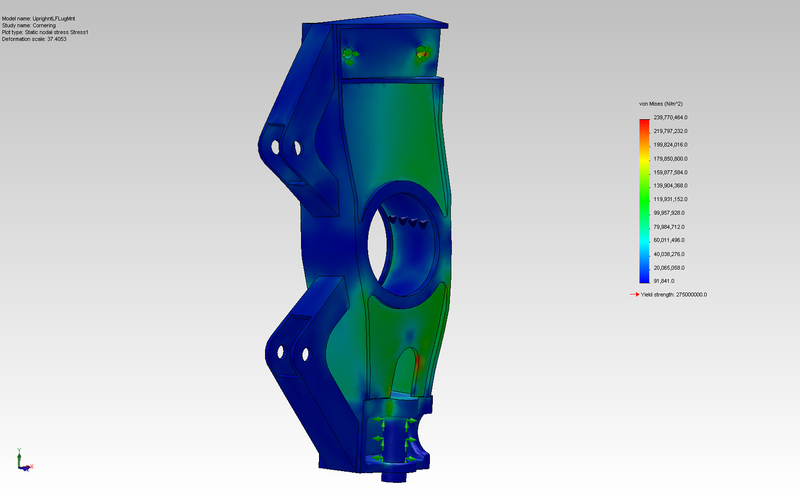 Finite-element analysis stress plot for fabricated upright. Strong enough, but where are those heat-affected zones? Here’s the final result of literally hundreds of design revisions, ensuring that the upright is strong enough and as light as possible. 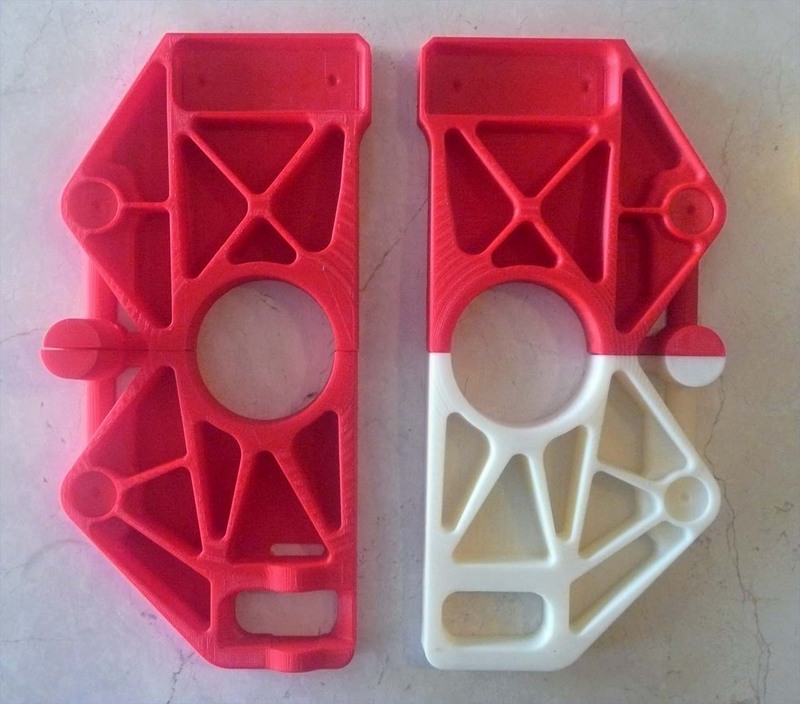 This design is made possible by the new technology of 3d printing, which will be used to make the master “plug”, from which molds will be made to cast the actual part. 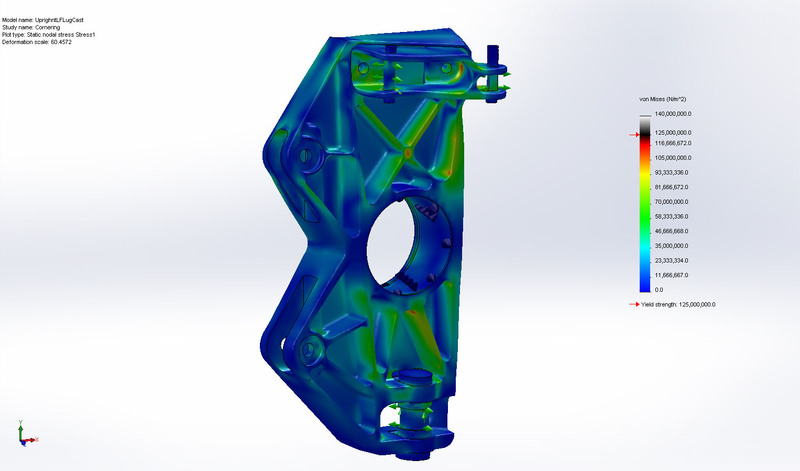 Note that the steering arm is not an integral part of the upright, but is modeled together with the upright because the FEA runs much faster this way. 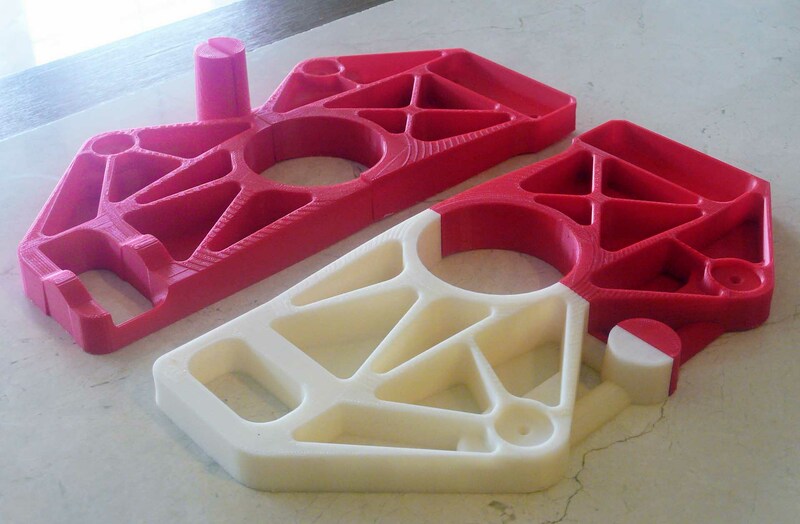 The upright had to be split into four pieces for 3D printing; split vertically so I can make two mold halves and remove the masters from the molds, and split horizontally to fit the 3D printer. 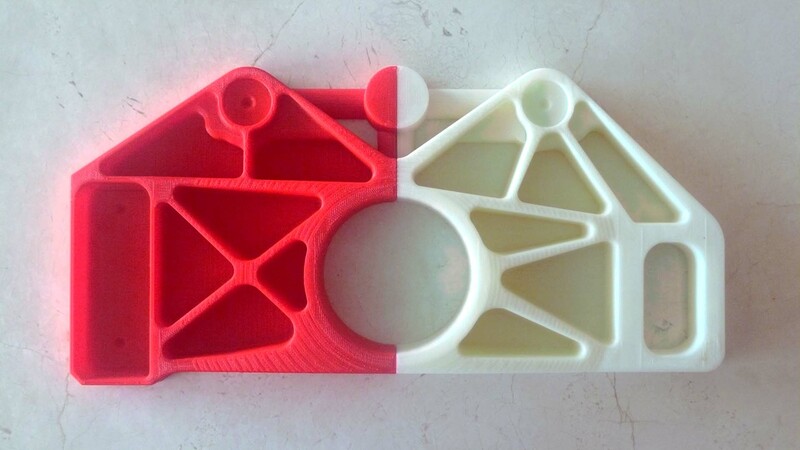 The 3D printer extrudes hot ABS plastic in X-Y layers onto a heated Z-axis stage with 0.3mm resolution. The print is slightly rough and the parting plane is slightly warped, which will have to be corrected with auto body putty, primer, sanding, and paint. 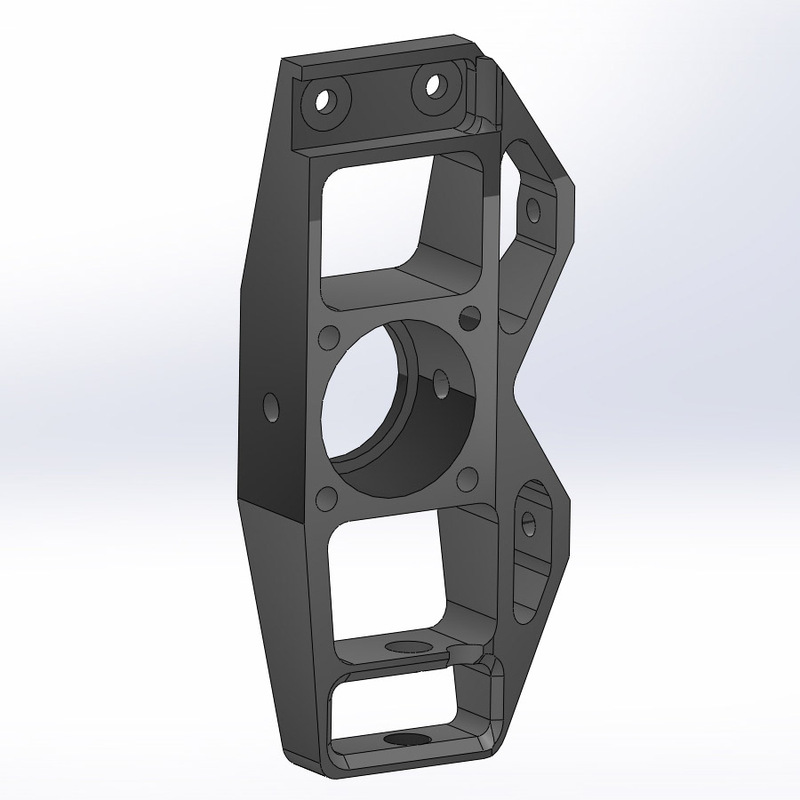 The cast aluminum blank will still require several machining steps to cut off the gate and sprue, drill mounting holes, bore the bearing hole and retaining ring slot, and mill the brake caliper mounts. 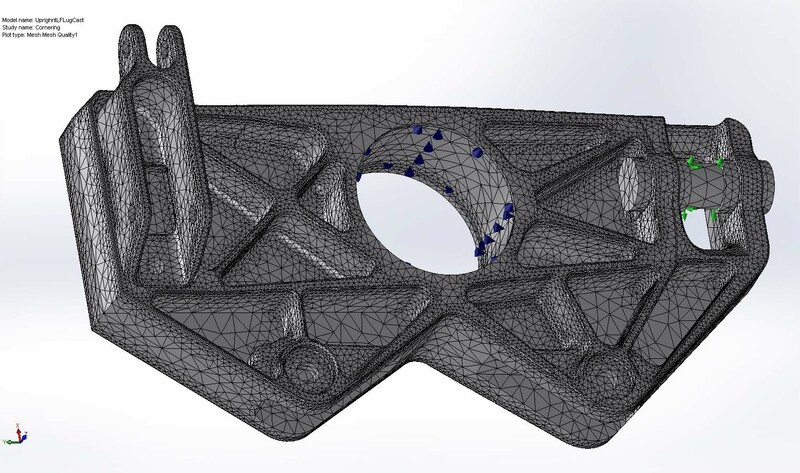 Still far better than trying to machine individual parts (or even a mold pattern) this complex, which would be approximately impossible and semi-infinitely expensive. Full set of four 3d prints. The cylinder protruding in the upper left is the gate, where molten aluminum will be poured into the finished mold. Some people get excited by shoe sales. I get excited by this!